If you have been hoping to take a hiking holiday on Mars, but have found your plans spoiled by the dreadful lack of detailed maps, fear not: the European Space Agency has come to your rescue. ESA scientists have developed a series of ordnance survey-style maps of the red planet, using data from the High-Resolution Stereo Camera (HRSC) experiment on the Mars Express probe. So far the maps are confined to one relatively small region, but the researchers behind the maps say there is no reason the technique could not be applied to other parts of the planet as well. 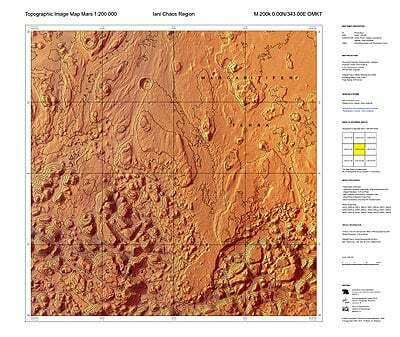 The maps are based on high resolution images of the so-called Iani Chaos region, and feature detailed height contours, as well as names for many of the geographical features. The researchers chose this area of Mars because its surface is particularly interesting. It is a large depression some 330km by 430km across, but its surface is hilly and strewn with rocks. The high points of land are probably the remnants of an older surface of Mars, and make for a more interesting topographical challenge than mapping the contours of sweeping sand dunes. The researchers say these islands were most likely left behind when the land in between sank into cavities below, possibly as ice melted in volcanic heat. The water would have flowed away into the Ares Vallis, towards the northern lowlands of Mars, leaving the rugged and mixed-up surface we see today. The maps, which range in scale from 1:200,000 right down to 1:50,000 have been produced by researchers at the Institute for Geodesy and Geoinformation Science, Technische Universität, Berlin, and the Freie Universität, Berlin.